Broad Heath Blogs»Class Blogs 18-19»Class 2 Blue Blog 18-19»2 Blue Super Homework! In Topic this week we have been finding out all about another famous person, Mo Farah. 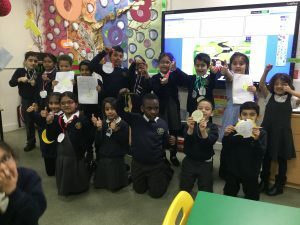 Mo won gold medals at the London and Rio Olympic Games in the 5000 and 10000 metres, so our Wow homework activity was to design our own Olympic medals. Take a look at our creations. We are sure even Mo Farah would be proud to wear them! Good 😊 job for making the medals.